Black 2 and White 2 are direct sequels to their predecessors, and both will land in the US in fall 2012. First announced on Japanese TV show PokÃ©mon Smash and then confirmed by Nintendo of America Inc., news about PokÃ©mon Black Version 2 and White Version 2 boils down to this: the two new games will drop first in Japan in June this year, with a European and North American release following at some point during fall 2012. In a departure from the normal PokÃ©mon routine, both games are direct sequels to the respective Black and White titles. The games will be playable on the DS and 3DS, and feature prominently two new legendary pokÃ©mon (as pictured). Named Black Kyurem and White Kyurem respectively, details regarding their origin and whether or not they're anything more complex than colorful (or maybe evolved?) 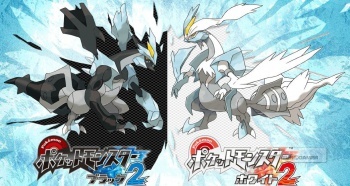 versions of the original Kyurem pokÃ©mon from Black and White have yet to be released. Not to worry, though: Nintendo of America has promised to release plenty more details about the games and their monsters between now and the various global release dates. Until then, we're left to wonder why Nintendo chose right now to break its traditional PokÃ©mon development cycle and branch off into the world of direct sequels. Will we see more mineral-based titles in the future? Was anyone else hoping for PokÃ©mon: Scandium and Lanthanum (I totally was)? Ears to the ground, PokÃ©-fans.